Pico Union Project and Deborah Rosen co-produce the theatrical dance performance Tashlich on September 24, 2016 at 8 PM, as part of S’lichot services at the Pico Union Project. Tashlich aims to encourage and inspire personal transformation, enhance our relationships with others, and provides spirit and strength towards evolving in our personal and shared journeys. Pico Union Project and Deborah Rosen are excited to announce their co-production of Tashlich, choreographed and directed by Deborah Rosen, will meet with its audience on September 24th at the Pico Union Project, as part of S’lichot services. The services will be lead by Craig Taubman, Wilshire Boulevard Temple’s Nefesh, and Rabbi Susan Goldberg. 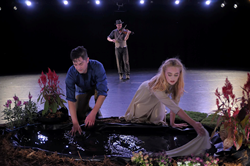 Tashlich is a theatrical dance piece that takes the audience through a journey of introspection, inspiration, and exploration through five dance sections performed by six dancers; ceremonial participants, a vocalist, and a live musician serving as a spirit guide and shoe cobbler. Within and in between dances the guide and the dancers share stories, songs, and poems that strengthen and further inspire the ideals of this ritual. The ensemble will navigate through an array of emotions, deepening their internal connection to who they are, exploring what that means, and thereby strengthening their journey forward. Integrating traditional contemporary Jewish folk dance, gesture, live music, song, poetry, and stories; the choreography and direction of Tashlich will bring moments which emulate times of deep meditation, along with occasions of whimsy, joy, insight, and appreciation of life. Tashlich is intent on stirring mindfulness in recognizing the audience's ability to amend, forgive, and persevere. "Tashlich aims to encourage and inspire personal transformation, enhance our relationships with others, and provides spirit and strength towards evolving in our personal and shared journeys,” said director and co-producer Deborah Rosen. All are invited to partake in this transformative experience to welcome the new year. Tickets for this event are $20. Admission is free for Sanctuary@Pico Union pass holders.